My original review of Guardians of the Galaxy, written and posted in August 2014 can be found here. When intergalactic terrorist Ronan (Lee Pace) threatens the galaxy, an unlikely group of heroes – all criminals of some kind – are forced to work together to stop him. Guardians of the Galaxy is the first proper foray into space and beyond for the MCU. Each world our dubious heroes visit is its own unique place. The design of each of these worlds and their cities have so much personality and all look like real-lived in places. The special effects make space look beautiful and the whole film is full of colourful worlds, costumes and characters. 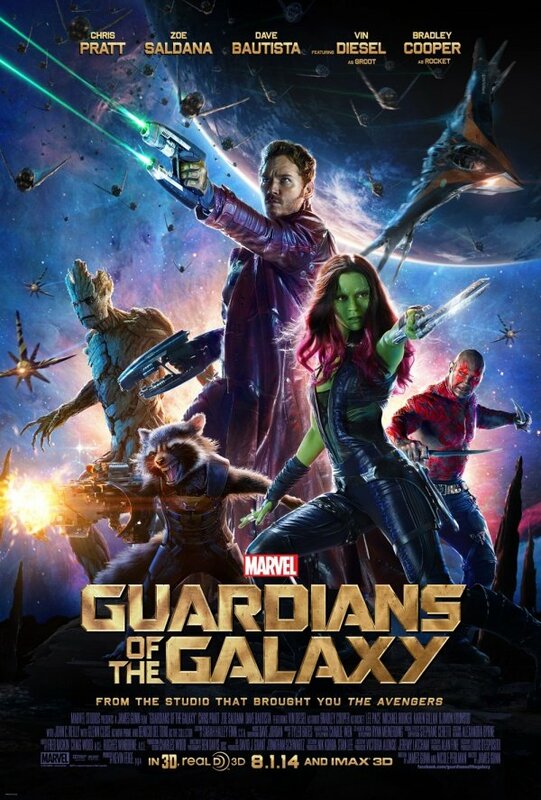 The so-called Guardians of the Galaxy are formed of Peter Quill aka Star-Lord (Chris Pratt) a man who was kidnapped from Earth when he was a child and has grown up to be a thief, Gamora (Zoe Saldana) an assassin, Drax the Destroyer (Dave Bautista) who takes everything literally, Rocket (Bradley Cooper) a genetically engineered racoon and Groot (Vin Diesel) a large talking tree. They are an odd mix of characters who certainly don’t get along all the time, but their dynamics are often both compelling and hilarious. I can’t not mention the soundtrack. Music makes up a huge part of Guardians of the Galaxy and all the songs add something to the action on screen, whether it adds to the humour or to the emotion these characters are feeling. The soundtrack is just as fun as the film is. The only thing that really lets down Guardians of the Galaxy is its villain. Ronan is your typical bad guy and forgettable one really. It’s other antagonistic characters like Nebula (Karen Gillan) and Yondu (Michael Rooker) who are more convincing adversaries as they both have history with our heroes. 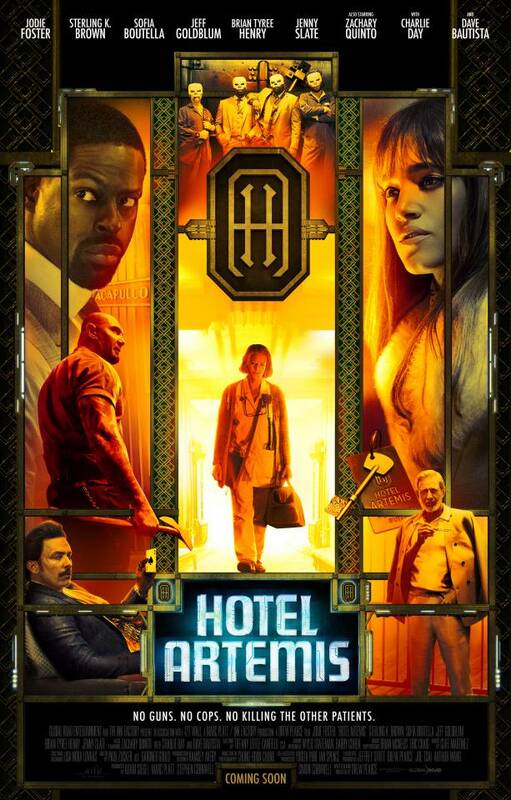 Also the plot itself is quite cliché but the way its executed makes it more unusual and entertaining. Guardians of the Galaxy is so much fun. It’s really a near-perfect mix of humour, action and larger than life characters who each get their moment to shine and who forge a surprising connection. 4/5. When Lucy (Brittany Snow) returns home to Bushwick, a neighbourhood in Brooklyn, from college she soon discovers an unknown military force has taken over the neighbourhood. She meets war veteran Stupe (Dave Bautista) and together they fight to make it one block at a time to safety. The way Bushwick is filmed is really engaging and different to the usual action, shoot-’em-up type of film it is. 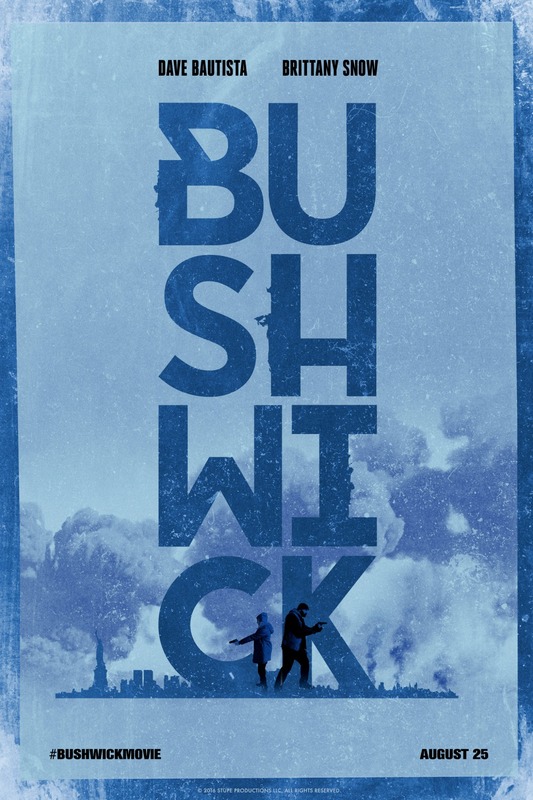 Bushwick is mostly made up of a sequence of long, tracking shots that follow the main characters. Most of these happen on the streets and this adds to the sense of panic and insecurity as you as the viewer can only see as much as the characters, and sometimes even less than what they see. It increases the tension as gunfire can come from all directions, and it’s difficult to tell who is friendly and who is not. Because Lucy and Stupe are almost constantly on the move, running across streets and taking shelter in buildings, the film never really lets up. It moves from one action, gun-filled sequence to the next, barely letting you or the characters have time to breathe. There are a couple of moments where Lucy and Stupe have a chance to actually talk to one another, one of which gives Bautista a great monologue. When you learn more about the invading military force that’s terrorising the streets, it becomes clear Bushwick is a film for these times. It’s about a country that is in some ways divided, but in others is stronger together. There’s a great moment when you learn the invading force thought the neighbourhood would be an easy target because it is made up of a diverse group of people, but they underestimated them and these people who have different backgrounds are instead fighting side by side. Bushwick is a fast-paced and thrilling action film. It offers some interesting commentary on modern day America which might be a bit on the nose, but the performances are generally good and the action is relentless. 4/5. 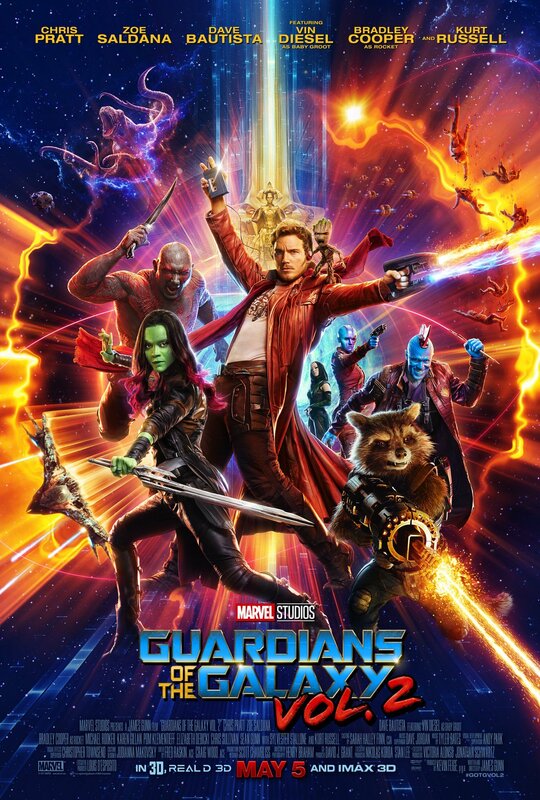 The Guardians of the Galaxy are back, working for money, and going off on adventures till Peter Quill’s (Chris Pratt) father, Ego (Kurt Russell), comes into his life. Guardians of the Galaxy Vol. 2 is a lot of fun. Drax (Dave Bautista) continues to be a standout as his brutal honesty and lack of understanding of social queues make many a witty moment. There’s a lot of one-liners and the relationship between this characters is charming and brings a lot of the humour. There’s a great theme of “found family” running through Guardians of the Galaxy Vol. 2 (anyone who knows me know that’s my favourite trope ever) and it was done really well. You got to see how the team had grown closer since the previous film and the banter and arguments between them all is a highlight. The five characters who make up the Guardians of the Galaxy are great and you get new dynamics to the team with Yondu (Michael Rooker) and Nebula (Karen Gillan) who have bigger and more interesting roles this time round. The actual plot isn’t so great – I won’t go into the plot a great deal as the promo stuff for Guardians of the Galaxy Vol. 2 really has shown only about the first 20 minutes of the film. (Well done marketing department for not showing a load of spoilers and climatic moments). It often feels like a series of scenes and funny moments stuck together with no real overall arc for a lot of the characters. For instance, Gamora (Zoe Saldana) is a character who often feels short-changed. The film is a bit messy and while I enjoyed the film as a whole, it did leave me feeling it was a good example of style over substance. Because Guardians of the Galaxy Vol. 2 is a beautiful looking film. It’s colourful and CGI galore but it works pretty well and looks great. The alien creatures and planets are all different which makes this space opera richer and wonderful to look at. Plus, it still has an amazing soundtrack that will have you bopping along in your seat or smiling to yourself. Guardians of the Galaxy Vol. 2 is a bright, fun addition to the Marvel Cinematic Universe. It’s funny and entertaining but it doesn’t really leave a lasting mark. 3/5. When James Bond’s (Daniel Craig) past comes back to haunt him, he discovers a sinister organisation. Meanwhile in London M (Ralph Fiennes) has battle a political programme to keep the secret service alive. The opening sequence in Mexico was amazing. It really starts SPECTRE with a bang and it’s a highlight of the film. The continuous tracking shots of Bond as he moves from the crowded streets to the rooftops are brilliant and then the helicopter stunts are tense and jaw-dropping. It’s one of the best opening’s to a Bond film and then follows Sam Smith’s theme song which plays incredibly well with the title sequence. SPECTRE has a lot more humour than the previous Craig-Bond films and it does well in balancing the humour and the tension. The action-scenes are still pretty great but t’s the hand-to-hand fights that are the most impressive. When Bond faces off against Mr. Hinx (Dave Bautista) it’s a sight to behold and I loved Hinx, he’s huge and deadly but also smart, definitely a worthy adversary for Bond. The guy puling all the strings is Franz Oberhauser (Christoph Waltz). He commands the screen whenever he appears and he has great chemistry with Bond. Part of me wishes there was more of him in SPECTRE because he was a joy to watch on screen but then I think it was great having this omnipresent character in the shadows, just out of reach and taunting Bond. Team MI6 were great in SPECTRE. M has his own story and it’s great to see him in a political battle with Denbigh (Andrew Scott). I continue to love Moneypenny (Naomie Harris), Q (Ben Whishaw) and Tanner (Rory Kinnear) and their relationship with both Bond and M, SPECTRE makes Q and Moneypenny seem more like their own characters even though their primary purpose it to help M and Bond. The main problem I had with SPECTRE is that there’s so many references to previous Bond films. I probably wouldn’t have noticed anything if I hadn’t had my Bondathon this year but watching SPECTRE I couldn’t help but be reminded of various Bond films. 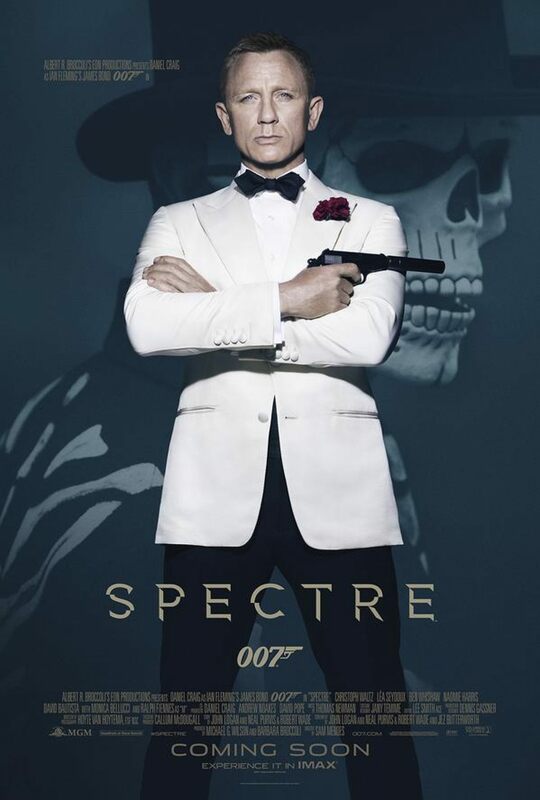 Elements from Dr. No, From Russia with Love, On Her Majesty’s Secret Service and Licence to Kill are all featured in SPECTRE to various extents. In some ways it could be a nice homage but really I found it quite distracting and SPECTRE didn’t really end up feeling like it’s own film. SPECTRE is a lot of fun and is action-packed but the continuous references to previous Bond films is quite jarring and the ending wasn’t quite what you’d expect for Bond. 3/5.